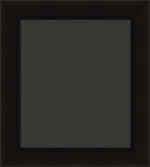 Black frames are standards and go with many styles of artwork. They go well with contemporary art and work well with many backgrounds. 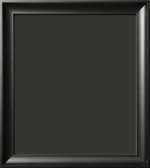 Our ready-made frames come in standard sizes and suit a wide variety of home décor styles and can range from simple to more ornate. 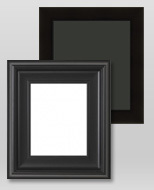 Browse our large collection of black picture frames below to find the right one for you. 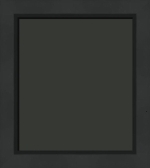 Marilla Matte Black Pyramid Top Art Frame 1 1/8"
Michelina Contemporary Matte Black Flat Top Art Frame 11/16"
Newell Black Flat Top Painting Frame with Black Bevel 7/8"
Rashida Contemporary Matte Black Cube Frame 1 1/4"